Physical Appearance: _Lina's fur is an enchanting, dark hued shade of ruby red. Contrary to the harsh lifestyle a ranger tends to live, she has managed to keep a silky smooth, sleek finish to it. It's almost as velvet to the touch, yet doesn't reflect sunlight in a way that would betray her position. Her left eye a hunter green, her right a sea blue, they are constantly sparkling with a light of curiosity, adventure, and speak volumes of her expertly trained marksmanship. The tip of Lina's left ear is missing, appearing to have been cleaved off by a bladed weapon due to the clean nature of the cut. Pertaining to clothing, the squirrel is dressed in a tunic the same hue as her eyes. The tunic is fit, accentuating her body, yet doesn't restrict her movement. The left sleeve reaches down to her wrist the same as any other long sleeve tunic, but there is no right sleeve. Lina's right arm is exposed entirely, save for the worn out, fingerless leather glove she wears to draw the string of her bow. Her tunic also seems to have intricate, gold-threaded designs sewn into the back, displaying a panorama of vines and leaves at the shoulders. The last notable feature of the tunic is its dipping cut in the front, exposing the flat of her chest only slightly. Accompanying the tunic is a pair of linen pants, the same colour as the rest of her ensemble. Slightly tattered at the bottom hems, having been weathered by forest and mountain, they are threaded in an X pattern on the outer side of each leg. On Lina's right thigh is a leather belt adorned with several small pouches, typically used to house small goods such as medicinal herbs. Possessions: _Lina's possessions are few and far between. In her company is her longbow, lovingly hand crafted from yew wood. 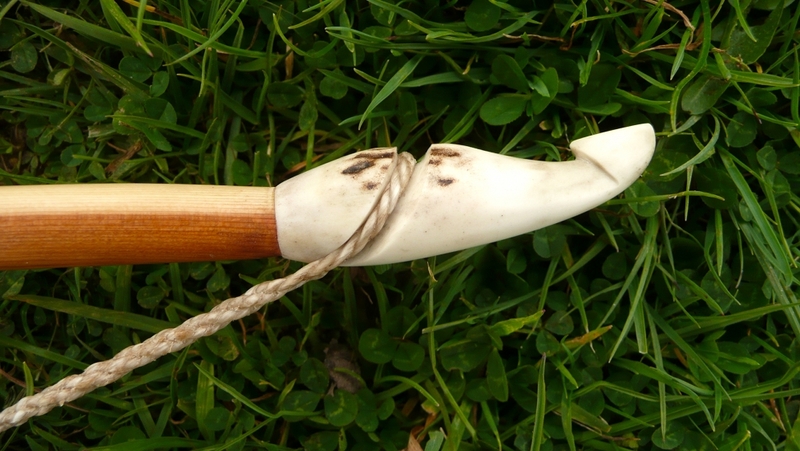 The nocks at each end of the bow are crafted of whale bone, the top having a hooked finish, the bottom a flattened one. 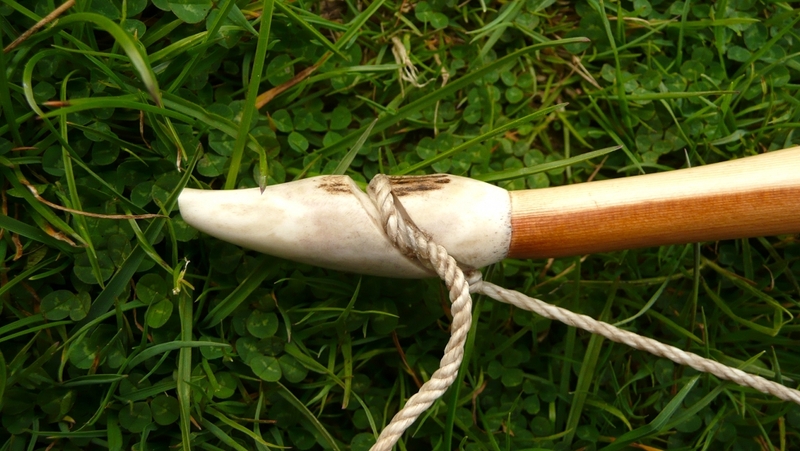 The plate in which the arrow rests on is also crafted of whale bone, embedded into the bow. Finishing off the bow is a leather grip, where, naturally, Lina's paw grips the weapon. Strengths: _At a distance, Lina is a force to be reckoned with. Able to nail targets with frightening, pinpoint accuracy even at full speed while bounding through trees, there are few targets she can't hit. The farther away from the target she is, the better off she is. Weaknesses: _Even though Lina can fight decently in close quarters, it doesn't mean she possesses the proper strength to fight larger opponents. Her training with a bow, and preference for ranged combat, has left her somewhat physically weak. She can be easily overpowered if caught, with likely disastrous results for her. Personality: _Lina is a kind, caring, and compassionate squirrel who treasures her friends and those she comes to think of as family more than anything else in the world, particularly because of her reclusive life as a ranger. Lina's essential view of the world is comprised completely of those she becomes close to, and when one of those people is killed or passes away, she feels as if a part of that world is destroyed. History: _After losing her mother relatively early in her life, Lina was brought up solely by her father in the more reclusive parts of Mossflower. As she approached adulthood, her father taught her the ways of living off the land – what berries were safe to eat, tracking, and other various facets. Most importantly, he instructed her in the skill of wielding a bow and arrows. Things continued like normal for a while, the two managing to avoid many of the troubles of Mossflower such as thieves or other undesirables. They were an entirely self-sustaining family, content to ignore an be ignored in the world around them. Lina quickly became an adept at surviving in the wilderness, much like her parents before her. One day, Lina went out to gather some fresh berries for her and her father. She left early that morning, setting out to obtain the berries to bring to her home. After spending the entire day hunting, she finally returned home late in the evening... only to find that her abode had been pillaged. Wracked with distraught, Lina desperately sought out her father to make sure he was all right. To her dismay, he was mortally wounded. Sprawled out in the middle of the floor, she was barely able to discern his last words: that the destruction, and his inevitable death, had been caused by corsairs scavenging for supplies. She felt his body go limp in her arms, and an overwhelming hatred rise up in her heart. It wasn't long before Lina set out, bow and arrows in hand, to avenge her father. Perching herself up in a far off tree while the rats, weasels and other assorted vermin slept, she began loosing one arrow after the other, bringing down the small encampment one wretch at a time. Silently they were all slain, but Lina knew that couldn't be the end of it. There had to be more. She couldn't go home. Not sure if I'm supposed to double post, particularly in character applications, but this is just to let everyone know that I made a few adjustments to Lina's profile (which are noted in the change log section of her app). If anyone wants to reference things, such as role plays she's in or has been in, and whether or not they're completed, this is the place to look obviously. The change log, although it may get long, is there to keep track of things that I want to change, or that administrators or moderators ask me change. Think of it sort of as a precautionary thing. Anyhow, that's all. I will keep this updated regularly.